As a team, we are bonded by our passion for horses and veterinary medicine. Together, we use all of our knowledge and experience to keep your horses healthy. Sarah Puchalski has developed an international reputation as an expert in equine diagnostic imaging and is a managing partner here at Circle Oak. She bases her practice, Puchalski Equine Imaging, at Circle Oak Equine. Sarah is a Canadian and was educated at the University of Saskatchewan and completed her diagnostic imaging residency at the University of California, Davis. 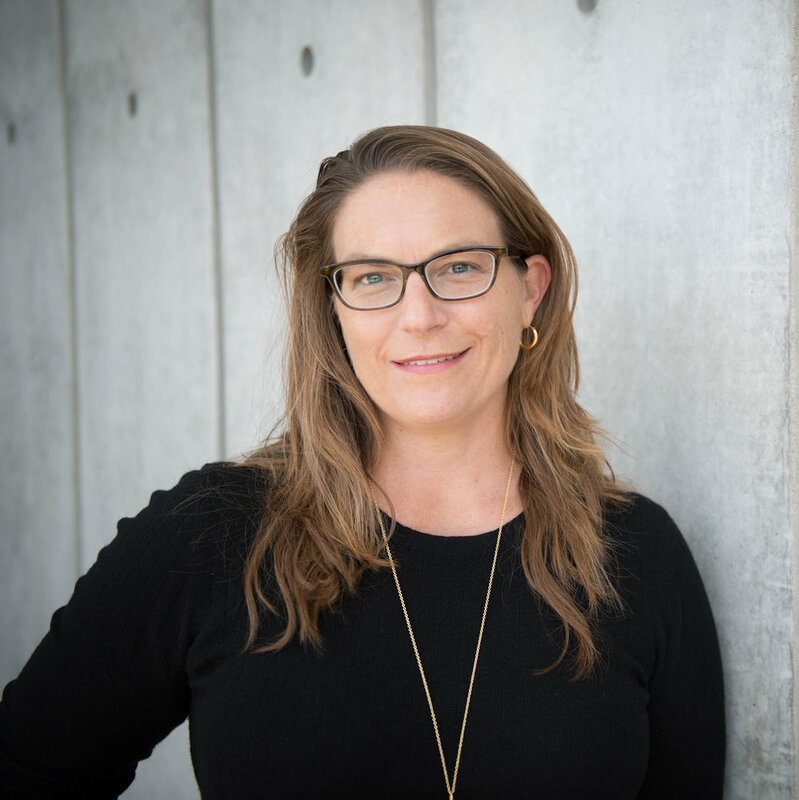 As an assistant, and later associate, professor at the UC Davis School of Veterinary Medicine (2005 – 2013), Dr. Puchalski focused on didactic and clinical teaching, research and clinical radiology. Her research interests surround the use of novel imaging techniques for the diagnosis of lameness conditions in equine athletes. Dr. Puchalski opened her consulting practice in 2013, and consults remotely for numerous practices across Europe, Australia, the US and Canada. At Circle Oak Equine, she reads all of the radiographic and MRI images. Her goals are to continue to elevate the quality and role of diagnostic imaging in equine medicine through continuing education, research and by offering consulting services to equine veterinarians throughout the world. Dr. Carrie Schlachter is one of the founding members of Circle Oak Equine’s state of the art equine medical and surgical facility. She is board certified by the American College of Equine Sports Medicine and Rehabilitation. Dr. Schlachter graduated from the University of Pennsylvania School of Veterinary Medicine and New Bolton Center, where she received the Charles F. Reid Clinical Excellence Award for Sports Medicine and Imaging as well as numerous scholarships. She grew up riding horses in the competitive ‘A’ circuit on the East coast and has almost 35 years of experience with horses as a rider, veterinarian and owner. Dr. Schlachter takes an active role in shaping the next generation of veterinarians through her work with students, the ACVSMR and the AAEP. Her practice focuses solely on sports medicine, with special emphasis on digital diagnostics and rehabilitation. 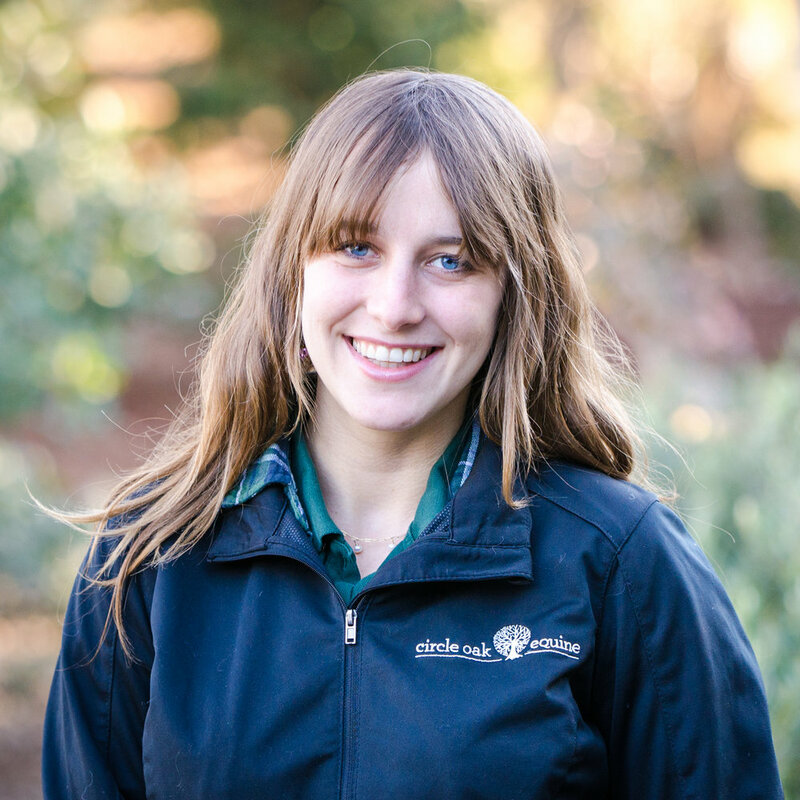 Dr. Courtney Lewis joined the Circle Oak Equine family in 2015 as our veterinary intern, upon graduation from the University of California, Davis Veterinary School. Dr. Lewis earned her undergraduate degree in Genetics at UC Davis, where she participated in both human and equine veterinary research and was a veterinary technician at Circle Oak Equine. She grew up riding in Marin County, competing in the hunter/jumper circuit. It is not surprising that with this background, Dr. Lewis quickly developed an interest in equine medicine, particularly lameness and imaging, during her vet school years. After two years of internship, Dr. Lewis was promoted to Assoicate Veterinarian in early 2017. 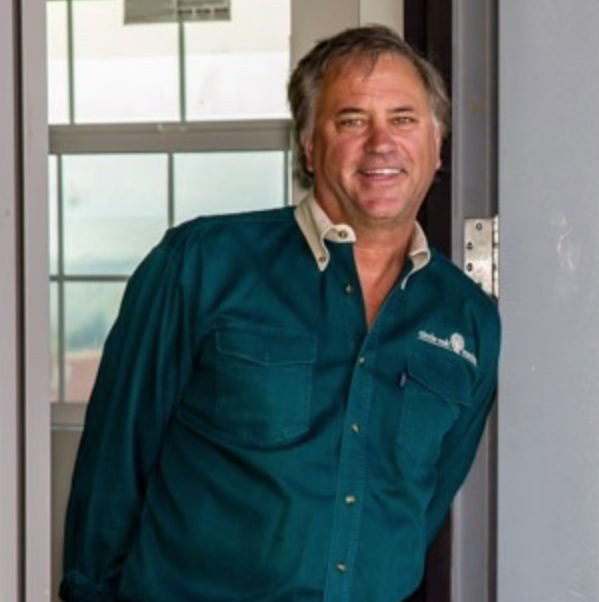 Dr. James Myers joined the Circle Oak Equine family in 2019. After serving the greater Sonoma and Marin counties as an ambulatory practitioner, Dr. Myers is now offering in house services for equine reproduction and lameness, in addition to ambulatory services. Dr. Myers, who goes by Jim, grew up on the central coast of California in Paso Robles, riding horses mostly in the western disciplines. Not straying far from his home of Paso Robles, he completed his undergraduate studies at Cal Poly State University, San Luis Obispo doubling majoring in agribusiness and animal science. During veterinary school at the University of California, Davis, Jim worked as a surgical technician at the large animal hospital. 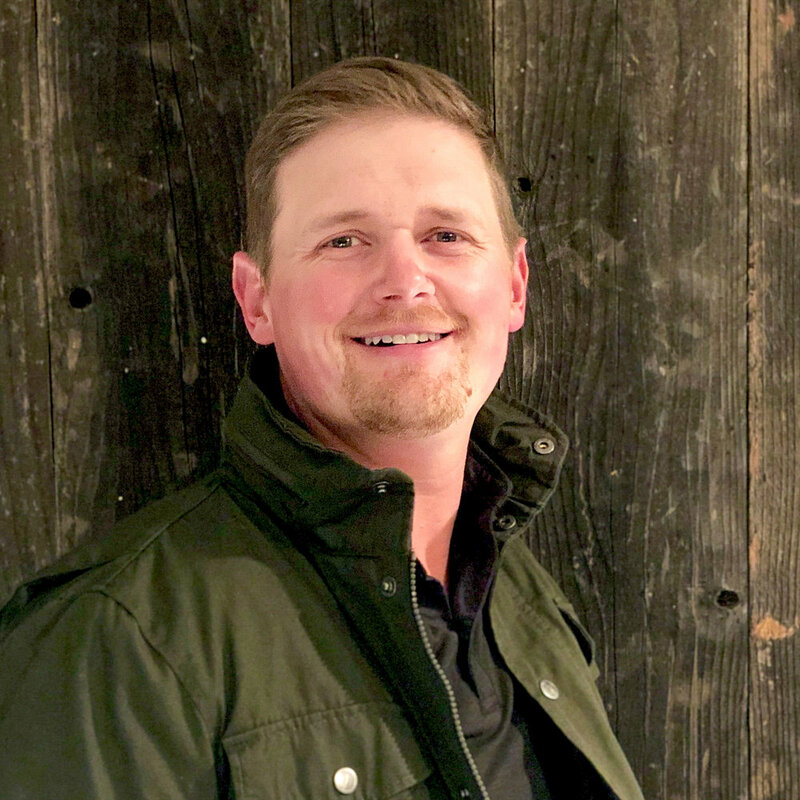 Upon graduation in 2013, he spent one year completing a rotating internship at Loomis Basin Equine Medical Center where he gained experience in caring for critically ill patients, anesthesia and advanced diagnostics. Upon completion of his year at Loomis Basin Equine, Jim moved east to pursue a residency in Theriogenology at the University of Pennsylvania, New Bolton Center. Upon moving back to the west coast, Dr. Myers worked in an ambulatory position with Sonoma Marin Veterinary Services offering ambulatory lameness, emergency medicine and reproductive services to clients of both the Sonoma and Marin counties. Jim is excited to be joining the Circle Oak Equine family and expand his reproductive and sports medicine services. In his downtime, Jim enjoys riding his three horses, traveling and the outdoors. Whether its the beach or the mountains there are always adventures to be had. Natalie comes to Circle Oak from Bayhill Equine in Redwood City, CA, where her practice focused on lameness, fitness and rehabilitation, using advanced techniques to diagnose and treat equine athletes. Prior to that she was an intern veterinarian at Alamo Pintado Equine Medical Center in Los Olivos, CA, and has experience in a hospital environment and managing critically ill patients. Before veterinary school, Natalie also worked as a technician at the University of California, Davis, in both the large animal ultrasound and intensive care departments. Natalie received her undergraduate and doctor of veterinary medicine degrees from the University of California, Davis and has completed a number of externships all over the world, including veterinary hospitals in Dubai, Europe and the United States. In 2010 she was the UC Davis student representative at the World Equestrian Games in Lexington, Kentucky, where she assisted the FEI and WEG veterinarians during the competition. 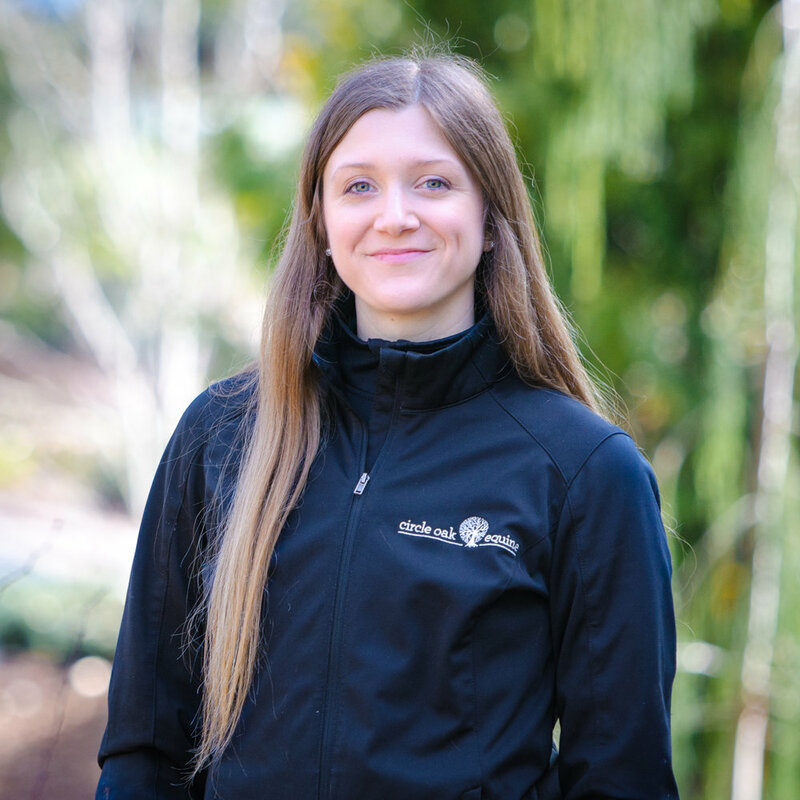 Like the other veterinarians at Circle Oak, Natalie loves to learn and has completed additional certifications and attended international symposia as she strives to stay at the forefront of equine sports medicine. Growing up in Northern California, Natalie competed in three-day eventing and dressage. Her passion later took her to England where she spent two invaluable years training and competing with her horses. Outside of work, Natalie enjoys outdoor activities and spending time with her two young daughters Cézanne and Ésme-Anne. Stacie is originally from Southern California, but grew up travelling around the world with her parents, living in more than 33 countries. She developed a love of horses growing up competing in show jumping up to the Young Rider level in Southern California. Stacie completed an undergraduate degree at the University of California, San Diego in 2008 and then graduated from veterinary school at the University of California, Davis in 2012. She then went on to complete an equine internship in Dover, NH followed by a radiology speciality internship in Los Angeles, CA. Following her internships, Stacie went to the Cummings School of Veterinary Medicine at Tufts University for a radiology residency. She achieved board certification in 2017. Anthony DeRouen is a Diplomate of the American College of Veterinary Radiology with a special interest in equine cross-sectional imaging. Anthony was born and raised in Southern California at the doorstep to Joshua Tree National Park. He developed a passion for the outdoors and animals at an early age, working on local ranches, raising guide dogs, and working for a local equine veterinarian. Anthony attended Colorado College in Colorado Springs, graduating with high honors in 2006. Anthony attended University of California, Davis for his veterinary degree, graduating in 2011. During veterinary school, he earned achievement awards for excellence in Large Animal Radiology and Large Animal Surgery. He then completed an equine internship in Glenwood Springs, CO. Following the internship, Anthony returned to UC Davis for his radiology residency. During his residency, Anthony published research on equine cervical spine malformations and their clinical relevance. He achieved board certification in 2015. Dr. Peter Heidmann grew up working with draft horses and learned horsemanship from old time horsemen. Dr. Heidmann has been Board-Certified in Large Animal Internal Medicine since 2005, with special emphasis on neonatology, infectious disease, and ultrasound. In addition to his core internal medicine interests, Dr. Heidmann’s practice also includes speciality performance evaluations and treatments. Dr. Heidmann sees referrals and consults on cases from veterinarians throughout our region, and has served as an expert witness in many legal, welfare, and insurance cases. He served as the Internal Medicine Specialist for the 2011 Pan-American games in Guadalajara, Mexico, and participated as one of the founding veterinarians of MSU’s Bioregions program to Mongolia in 2014 (www.bioregions.org). Jack Snyder brings both international acclaim and extensive expertise to Circle Oak. Dr. Snyder completed his residency and later assumed a faculty position as an equine surgeon at the University of California Davis School of Veterinary Medicine. The majority of his practice has focused on sport horses and he has held roles at the highest levels of international competition, including roles as distinguished as the official on-site veterinarian for the Olympic Games on five separate occasions. Dr. Snyder enjoys working with trainers and riders, worldwide, to help them develop and maintain stables of equine athletes that are sound and fit for rigorous competition at the highest levels. Upon retirement from academia, he chose to join Circle Oak due to our shared vision of full-service, state-of-the art sport horse veterinary care. Dr. Snyder’s diagnostic expertise and ability to see the ‘big picture’ dovetail with Circle Oak’s whole horse approach, our full array of diagnostic tools and our commitment to professional rehabilitation. Dr. Snyder is looking forward to working with the Bay Area equestrian community while maintaining an international practice. 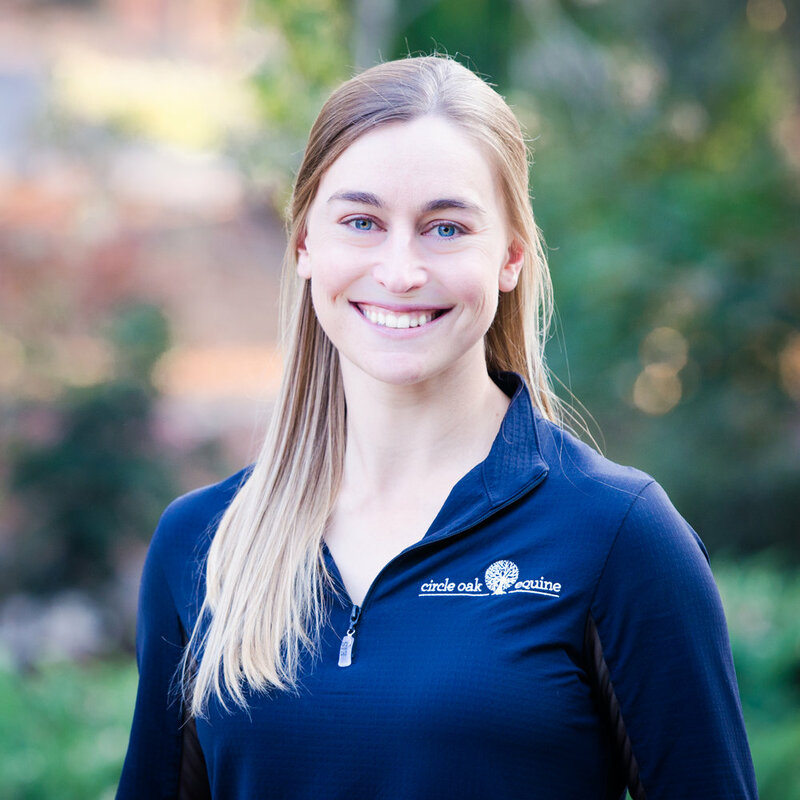 Nicole has assisted Dr. Schlachter in various capacities since 2008 and now manages the sports medicine portion of the practice, focusing on veterinary technician training, scheduling and assisting the doctors. She grew up riding horses in the Marin Headlands, as an avid competitor in numerous disciplines, and is a superb horsewoman. Nicole earned a B.A. in Equine Science from Virginia Intermont College and then returned to the Bay Area, where she managed a large thoroughbred breeding farm and was an exercise rider at both Golden Gate Fields and Del Mar before joining Dr. Schlacter's practice. Nicole works closely with Kari to ensure that our patients receive coordinated, thorough, comprehensive care. Krissy graduated in 2002 from Colorado State University with a BS in Equine Science. She then pursued a career in three-day eventing (2002-2007). In late 2007 Krissy moved to Davis and began working for UCD’s Veterinary Medical Teaching Hospital in the Large Animal Intensive Care Unit. In 2010 she moved into Large Animal Diagnostic Imaging Department as a radiographer, MRI technician, lab instructor and taught radiography to veterinary students. In December of 2014, Krissy left the university to pursue a career in the private sector. She has worked two winter seasons at Palm Beach Equine Clinic where she ran the MRI unit, trained operators and assisted with radiography questions. In addition to having a keen interest in equine diagnostic imaging, Krissy also has a passion for photography (many photographs found on this site are her work). © 2019 Circle Oak Equine. All rights reserved.